The Brandy Crusta is a drink that goes back to the God Father of American bar culture, Jerry Thomas. 1887 his milestone of bar culture was published posthumously under the title “Bartender’s Guide or How to Mix all Kinds of drinks”: In this book you can find numerous recipes for drinks, even some that are largely unknown today, amongst which real jewels are hidden. One of these is the Brandy Crusta. This cocktail is difficult to compare with other drinks, which is due to its very unusual preparation and presentation. As the name suggests, it is a drink on a brandy base. You can also mix the cocktail with gin or other spirits, but the brandy version is the original. For the brandy Crusta half a lemon is peeled in one piece, just like you would peel an apple with a paring knife. This gives you a large piece of lemon peel (you really cannot call it a zest anymore). 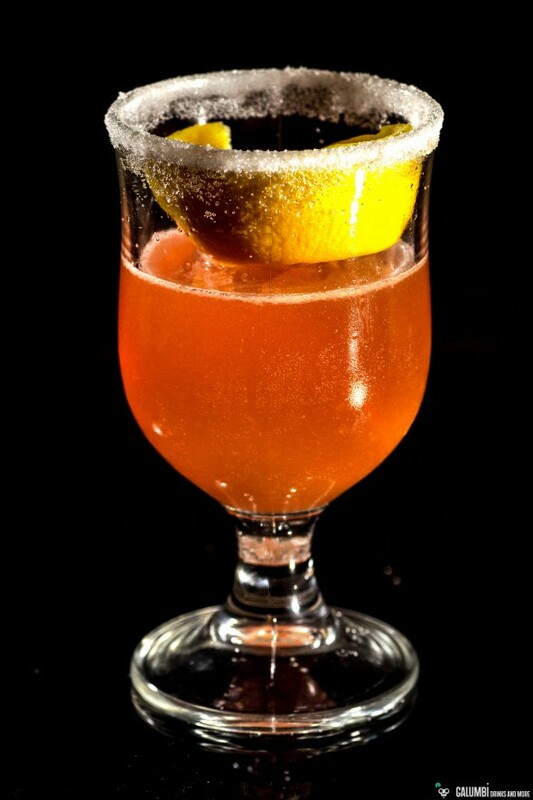 The drink is sipped over or through this lemon peel, which brings out fine flavors of citrus (especially to the nose). The brandy Crusta tastes sweet and fresh and gives the warm and dry toffee notes of a good brandy (e.g. Carlos I) a very interesting additional facet. First, as described above, peel half a lemon in one piece if possible, so that you get an all-round and wide-cut lemon peel. Now moisten the rim of your pre-chilled glass with some lemon pulp and turn in a plate of white sugar, so that a sugar rim is formed. Carefully put the lemon peel into the glass so it can stick inside and does not fall on the bottom of the glass. Then shake all ingredients vigorously with ice and double strain into the glass carefully without damaging the sugar rim. Jerry Thomas recommends that one should smile now. It is best to follow his instructions! 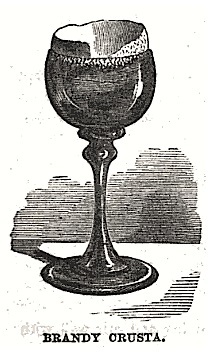 Glass: Jerry Thomas recommends a “fancy red wine-glass”. You can also use a regular Sour glass, or if you can find one, a special “crusta-glass”. This entry was tagged Angostura, Brandy, Crusta, lemon, orange curacao. I am digging this site so much. I received “Burke’s Complete Cocktail and Tastybite Recipes” and have been looking up the cocktails online to compare ever since. In the book I have, it adds maraschino and takes out the simple syrup, and im addition adds an orsnge slice for the finishing garnish. Look forward to trying both out! Thanks four your comment! Maybe you can share your experience with the other version!